I had a downline meeting and this is the project Rachel brought to do....a gel card. This was the first time I had made one and it is really cool. She got the directions from Nichole over at Papertrey. We used Fishy Friends and the Whimsey wheel on Tempting Turquoise. 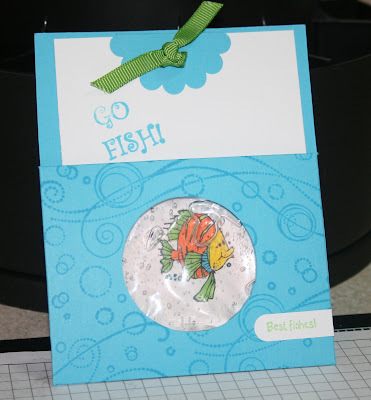 The wheel ink is TT and I stamped the fishy with Black Stazon and colored him with my markers. The greeting Best Fishes is from Very Punny, and the Go Fish is from Sparkle n Sprinkle. What a cute card!!!! I'll give it a try or better yet you could include it in the tech. classes.